The Atomic Booster is a high quality guitar effects pedal, designed and hand made in the UK to give guitarists a transparent, clean booster pedal which can boost the overall level and the treble from electric guitars to drive vintage and vintage style amps harder or to give a volume boost for solos. The overall volume can be boosted by as much as 20dB whilst the precision amplifier circuit adds no noise to the signal or alters the tone of your guitar. The treble boost facility of the Atomic Booster can add a glassy sheen to your guitar tone or give neck humbuckers more of a cutting edge or can be used to give distorted rhythm sounds a tight, well controlled bass with biting top end. 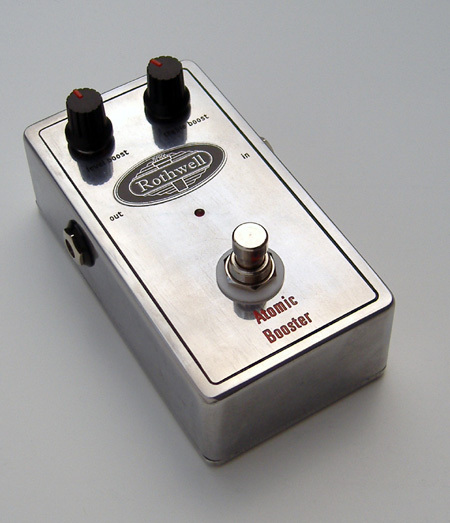 This pedal is a truly hand made, boutique effect, built to the highest standards and features true bypass switching. This leaves the guitar completely isolated from the booster circuit when the unit is bypassed so that your raw guitar tone is not affected in any way. When using vintage amps or vintage style, low gain amps, driving the amp hard enough to get a good rock sound can be a problem, particularly with low output single coil pickups. One of the reasons why the Gibson Les Paul came back into fashion in such a big way in the late 60's and early 70's is because their pickups had a higher output than Strats and Teles and could drive the amps of the day into more distortion. Some players used a booster of some description to get more drive from their pickups. The Atomic Booster will help you to get a classic rock tone from simple, vintage style amps in the same way as the pioneers of the genre got theirs - by playing it louder. However, unlike many 70’s boosters (and modern clones and repros) the Atomic Booster is a low noise pedal, built to a very high standard and has modern benefits such as a DC power socket (for use with external power supplies such as the Stompjuice), true bypass switching and high input impedance. The Atomic Booster costs £99 and is available from our uk and international dealers (full list) or from the online shop.